Br J Sports Med. 2013 Jul;47(10):e3. doi: 10.1136/bjsports-2013-092558.91. Comparing two eccentric exercise programmes for the management of achilles tendinopathy. A pilot trial. Figure 1 A. 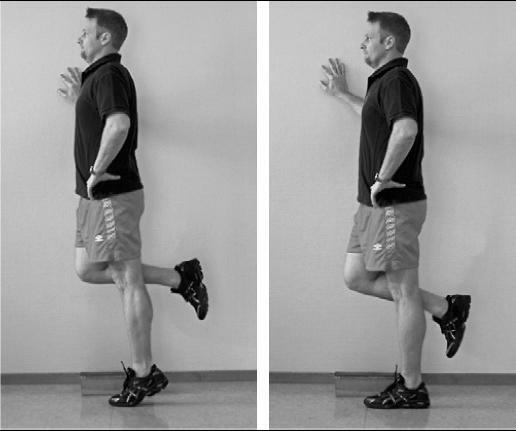 Start position for the eccentric insertional Achilles exercise. The patients stand with a straight leg, all weight on the affected side. From this position the heel is slowly lowered to floor level. To get up to the start position, the patients performed a heel-raise on the unaffected side. B. End position for the eccentric insertional Achilles exercise. 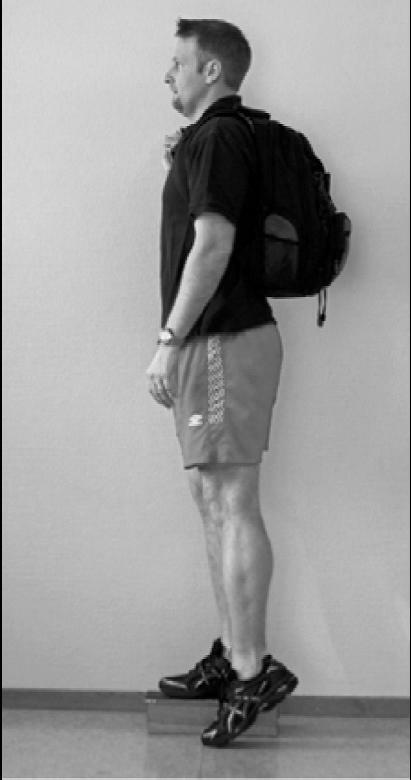 Figure 2 If there were bilateral symptoms the patients performed a leg press while standing on a box or a staircase to get up to the start position. This was done to avoid as much as possible concentric because of contraction in the calf muscle.Pain VAS went down from 7.2/10 to 3.3/10 at 4 months. 67% were “responders” and their scores dropped from 7/10 to 2.1/10. Knee Surg Sports Traumatol Arthrosc. 2008 Sep;16(9):859-64. Epub 2008 Jul 17. Sclerosing injections to treat midportion Achilles tendinosis: a randomised controlled study evaluating two different concentrations of Polidocanol. Willberg L, Sunding K, Ohberg L, Forssblad M, Fahlström M, Alfredson H.
52 cases – half given Pliodocanol 5 mg and half 10 mg/ml . Average age about 49. Pick cases with midportion tendonitis rather than insertional. Max 3 treatments with 6-8 weeeks in between. Those not satisfied were given the 10 mg/ml up to 5 treatments. At 16 month followup 18/26 or 19/25 were satisfied with threatment. With the addtional 5 treatments this was up to 26/26 for each group. This suggests to me the treatments should probably be more than 3 in many cases. I would include calf muscle massage/needling. Often wondered about heel lifts – just how high do you go? Gender and eccentric training in Achilles mid-portion tendinopathy. Knobloch K, Schreibmueller L, Kraemer R, Jagodzinski M, Vogt PM, Redeker J.
de Vos RJ, Weir A, van Schie HT, Bierma-Zeinstra SM, Verhaar JA, Weinans H, Tol JL. G.. help us – not another one-shot-wonder study – seriously, what treatment for chronic would ever go away with just one shot??? Clin J Sport Med. 2005 Mar;15(2):116-7. Topical glyceryl trinitrate for chronic Achilles tendinopathy. Foot Ankle Int. 2007 Oct;28(10):1064-8. Three-year followup study of topical glyceryl trinitrate treatment of chronic noninsertional Achilles tendinopathy. This entry was posted in Leg Pains. Bookmark the permalink. Interesting… I think I have a friend who might be able to use this, thanks! Pingback: Pain Medical Musing » Blog Archive » Prolotherapy to Mid Tendon Achilles Tendonopathy - Mediocre Results When Compared to Eccentric Loading Exercises - How Could That Be Better? 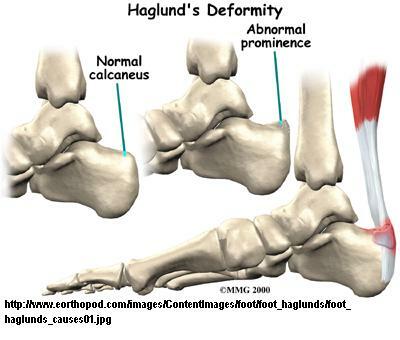 I have had the most luck with eccentric loading without dorsiflexion for my insertional Achilles tendinopathy. I often have ZERO heel pain on my morning walks now. I experienced varying amounts of pain in the muscles located just above my knees on the insides afterwards and now it looks like a vein blew out on my right knee in that area so I stopped my 12 week regime for awhile. Nevertheless I have had dramatically positive results in my heels and will try to tweak this method. A PT told me that my tendinopathy was age related and something I would have to live with. I am 59.